The Guards Van at Brockford Railway Sidings in Brockford, near Stowmarket sleeps 4 people. Tucked away on the site of the Mid Suffolk Light Railway, close to the Mid-Suffolk Light Railway Museum, these delightful and unique holiday properties (refs E5336 [The Station], E5337 [Railway Carriage One], E5601 [Railway Carriage Two] and E5639) are based on the railway theme: one a station building plus three converted railway carriages, enjoying panoramic views across rolling countryside. They have the added benefit of use of the owners’ nearby swimming pool and hot tub. Surrounded by country lanes, this is an ideal location for cycling and walking. Perfect for relaxing breaks whatever the season, this is an excellent base to explore the best that Norfolk and Suffolk have to offer, with delightful towns and villages within an easy drive. The nearby village of Debenham has a range of interesting individual shops, cafés and pubs, whilst the market towns of Stowmarket and Diss offer a range of historic and interesting buildings, and have a direct rail link to London for a day in the capital city. Other attractions within a short drive include the Norfolk Broads, the historic castle towns of Framlingham and Eye, Bury St Edmunds with its Theatre Royal (National Trust), Suffolk Heritage Coast, which includes the seaside resorts of Aldeburgh and Southwold, Dunwich Heath (National Trust) and RSPB Minsmere. Conveniently situated between the county town of Ipswich and the vibrant city of Norwich, both worth a visit, as is the glorious landscapes of Constable Country, and the Victorian seaside town of Felixstowe, both within easy reach. The nearest shop and pub are 2 miles from The Guards Van at Brockford Railway Sidings. 4 steps to entrance. The Guards Van at Brockford Railway Sidings is all on ground floor: Living/dining room with wooden floor. Kitchen. 2 bedrooms: 1 double, 1 twin (2ft 9in). Shower room with toilet. Electric heaters included. Travel cot and high-chair on request. Electric cooker. Sitting-out area and furniture. Welcome pack. All properties at Brockford Railway Sidings: Electric, bed linen and towels included. Freeview TV. Microwave. Wi-Fi. Parking. Natural 1-acre shared grounds. Shared use of owners’ indoor heated swimming pool ¾ mile (28m x 14m, depth 0.9m to 2m), open all year, heated May-Sep, private use by arrangement. Shared hot tub. No smoking at The Guards Van at Brockford Railway Sidings. For a better idea of where Brockford Railway Sidings - The Guards Van is, you can see Brockford Railway Sidings - The Guards Van on the map below. Brockford Railway Sidings - The Guards Van is in Suffolk; should you be on the lookout for a special offer, you can find all the special offers in Suffolk. It's always worth checking to see what is on offer at the moment. 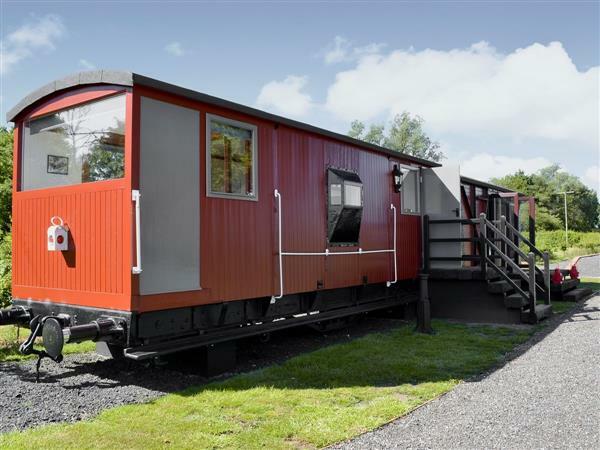 Do you want to holiday near Brockford Railway Sidings - The Guards Van (E5639), you can see other cottages within 25 miles of Brockford Railway Sidings - The Guards Van; have a look to find your perfect holiday location.